Have your own Dutch family recipe to share? Click here! Snert, snert, snnneerrrtt. The more you say it, the less likely you are to want to eat it. But trust me, although this short little word may sound inedible, its namesake is certainly not! 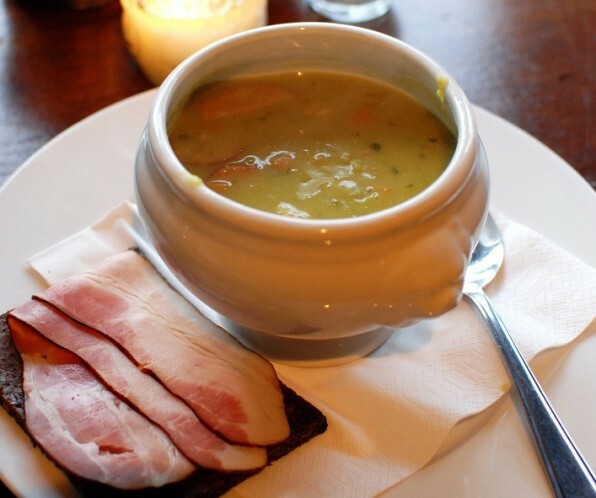 Snert (also know as Erwtensoep), is in fact, the Dutch word for traditional pea soup. This classic Dutch winter staple is a hearty meal in itself. There are endless variations on this dish and family recipes all tend to differ slightly. Some say the only true rule of thumb is to ensure 500g of split peas per litre of water. Others claim the soup is only a success if a spoon can stand fully upright on its own. One thing is for sure, you’ll rarely find a Dutchie who doesn’t have an opinion on what it really takes to make the perfect bowl. Do you have your own winning recipe? Why not enter the Pea Soup World Cup? Think I’m joking, guess again! The 21st edition of the Snert WK will take place on 20 February in Groningen. Now, go get practicing! !